With this are you find our range of Solid Fuel Inset Stoves, Freestanding Solid Fuel Stoves, Non Boiler Stoves, and Solid Fuel Cassette Stove. Solid Fuel or Multi-Fuel......we can find you a stove for your home. Solid Fuel Stoves There are 56 products. Within our Insert Solid Fuel Stoves Categories we stock and can arrange fitting on the most popular Solid Fuel Inset Stoves from Boru, Waterford Stanley, and Dimplex. Perfect for just about any room, With a choice of Single or Double Sided Cassette Stoves, with a choice of Boiler or non-Boiler Stoves from Trusted Brands! 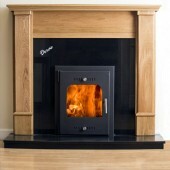 We Stock, and can arrange fitting on, the most popular Solid Fuel Stoves from Boru, Waterford Stanley, and Dimplex.